‘Inaudible Visions, Oscillating Silences’ is an exhibition aims to re-awaken appreciation of sound at large and daily soundscapes in particular. The exhibition provides a dynamic and creative stage for the thesis theoretical stance on a phenomenological approach to silence as consensual states. 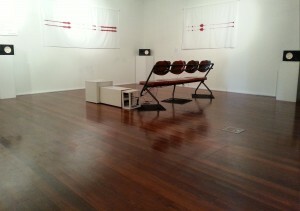 The 100sq/m exhibition was first installed at the Northern Rivers Community Gallery in Ballina (NSW) in March 2013. 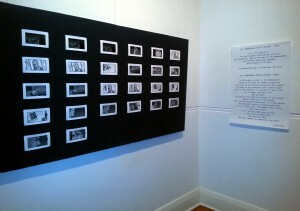 The displays in the different gallery spaces encourage visual imagination, auditory perceptions and bodily sensations. The design of the exhibition brings attention to the creative contribution of sound design on cinema audiences and its repercussions on sound appreciation outside cinema theaters. Cinema sound designers: Damian Candusso, Carlos Choconta, Tom Heuzenroeder, John Kassab, Markus Kellow, Evan Kitchener, Ben Leon, Roger Monk, Ben Vlad, Michael Worthington. The exhibition progresses over three distinct spaces and actively engages the audience on diverse physical and emotional levels. When entering the exhibition the visitors become partakers to the sonic activity of the gallery: they are invited to modify their listening patterns as they read, walk, watch and sit while sharing the space with sounds and visuals. Along the 3 interconnected galleries, the audience is exposed to environmental soundtracks extracted from the daily acoustic ecologies of the Lismore Campus Southern Cross University, to sound designers’ individual interpretations of Roger Monk’s script and to the storyboard drawn by Benjamin Leon. 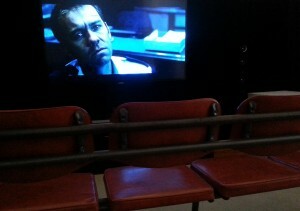 In the last gallery space, the screening of a movie scene, in conjunction with the soundtracks created for the exhibition, allows a questioning of individual and communal audio-visual expectations. This particular display gives ground to a sharpening of sound awareness upon leaving the gallery.